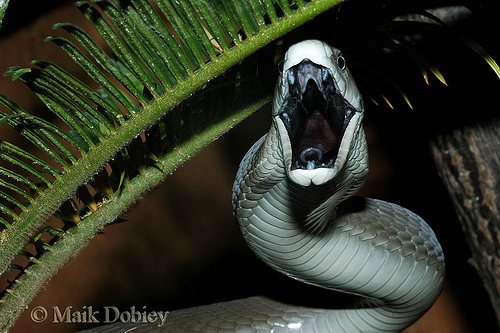 The creature in the photo is known by the name of the Black Mamba and is the most feared snake in Africa. The name is referring to it’s ink black mouth. 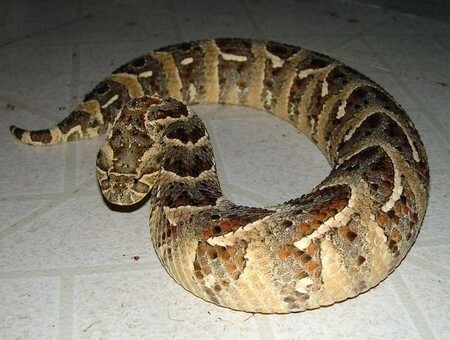 One bite delivers enough poison to kill 20 men; yet to the most fearless and ferocious animal on earth this deadly snake is only dinner! 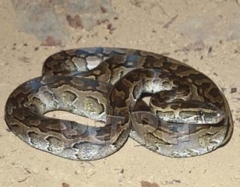 The African Puff Adder whose venom contains enough toxin to kill 5 men is no match either for the most fearless and ferocious animal on earth if the Mamba was dinner then the adder was lunch! The cobra who’s venom will kill a full-grown elephant is no match as well against the most fearless and ferocious animal and in seconds will be a it’s meal. Even the python with it’s bone crushing coils has it’s body shredded and consumed by the most fearless and ferocious creature. Have you figured out what who this creature is? 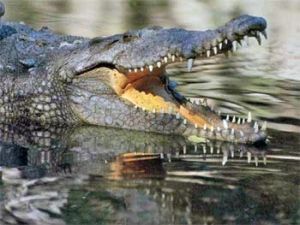 the young salt water crocodile! When I say the most fearless and ferocious I am not kidding, our little guy is BAD ! What else does he go after? Africa’s venomous tarantula ! 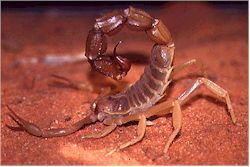 For an evening snack he will devour scorpions when he finds them . Lions and leopards are the only possible threat to our fearless and ferocious little guy and if they take him it will cost them dearly and usually costs them their lives! Other creatures on the menu are insect larvae, beetles, lizards, rodents and birds such as vultures and hawks!As well as springhare, polecat and particularly juvenile foxes, jackals, antelope and wild cats. By the way our most fearless and ferocious little guy eats the honey and larva of the killer bees. Do they sting him, yes! But he still eats the hive anyway! Who is he? He is known only for eating the hives. 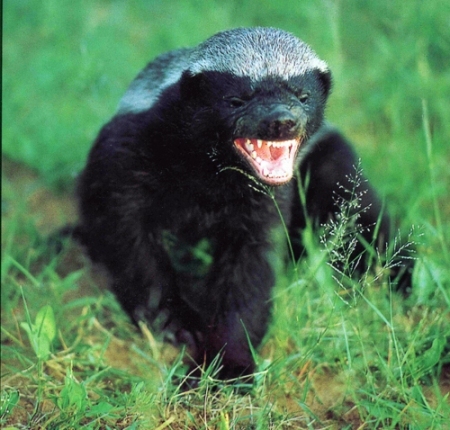 He is the African Honey BADger also known as the African Ratel. Wait, this Blog is about computers, where is the computer part? In the computer world there are also very deadly programs that will kill your computer and data. What bad programs? Viruses, worms, trojan horses, most rootkits, spyware, dishonest adware and crimeware. So what is the most fearless and ferocious program that is able to destroy these malicious programs? Are the CIA FBI NSA the same thing? Of course not. They server different purposes and are limited in their authority and influence; but they are very vital in this day and time. What they have in common is that they collect and act on information related to criminal activity or affects national security. So they are filled with James Bond types right? No! What their focus is and their boundries are are pretty much given in theirs names. The Federal Bureau of Investigation (FBI ) and Central Intelligence Agency (CIA) and National Security Agency (NSA). The FBI is primarily a law enforcement agency, collecting intelligence related to domestic security and performing crime investigation. In other words the FBI investigates crimes, and the CIA gathers intelligence. What does the National Security Agency handle? The NSA handles domestic intelligence in coordination with the FBI. In addition, the CIA often cooperates with international intelligence agencies to exchange information. The CIA may pass information regarding domestic security on to the FBI. The FBI also handles domestic law enforcement issues. The FBI coordinates national efforts to track down missing persons, complex investigations which local law enforcement cannot handle, processing of criminal evidence, and support for victims of crime. FBI agents frequently assist in the collection of evidence in major criminal cases, especially those involving a substantial amount of money or multiple homicide cases. What does this have to do with computers? EVERYTHING! You see foriegn unfriendly nations and groups can and do gather information through the use of your computer by way of implanting spyware and malware. This method is almost totally impercievable and very destructive. Not only can they gather intelligence from your computer but use your computer to commit crimes with out you being aware that anyone else is using your computer. Some recent examples are the Cyber attacks on the World Bank right before the economic world crash. The attack on the White House computers. But ones that can trigger the greatest damage are the botnets. They are malware that allows someone else to take change of your computer from a distance. As a mild threat they are use to send spam email but as a greatter threat they can be combined to crash any and all networks! Which is about what everything runs on! Picture if you will traffic any traffic, cars down a highway, water through a pipe, phone calls through a router or just your family coming and going through your house front door. Now instantly jump that incoming traffic to 10.5 million! What would happen to our communications network, our hospital’s network or our defence and police networks? This is the concern of our agancies that guard our nation! What botnet has 10.5 million computers under its control? The confiker worm! Here is the distributions of control the botnet has. Picture 10.5 million computers awaiting the command of their master! In the world of your computer it needs protection! You and your computer are part of our nations security! Your computer needs to have virus protection (like the FBI for our nation) and anti-spyware (like our nations CIA) and it needs to be more strengthed and upadated against attacks with the operating system updates (like our nations NSA). CHECK AND RUN UP DATES FOR YOUR OPERATING SYSTEM EVERY WEEK. When a Stone is Not a Stone. Fish hide in the rocks for safety. In this world survival and propagation of one’s species is assured if one of two factors are incorporated in your existence, mimicry or crypsis. Mimicry is to mimic the characteristic or appearance of a deadly or dangerous creature even though it is not equipped to or capable of carrying out what it appears to be or have. This is mostly used by prey. Predators on the other hand use crypsis or camouflage to appear benign and harmless giving a false sense of protection or safety to their prey. 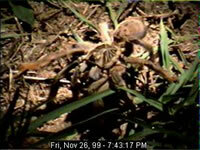 In the world of computers more and more programs are resembling life forms. If the program can not by its own abilities survive it will mimic the abilities of another! Our shelves and drawers are filled with programs that mimic the abilities of other powerful programs but were incapable of performing those abilities. Then there are the predator programs who appear to be harmless or benificial to guard and protect you but they are deceiving and will take a big bite out of your productivity, time and finances! These predator programs trick you into believing a problem exists on your system. Then you are given no alternative but to purchase the bogus applications because your existing antivirus and antispyware cannot resolve the problems because your antivirus and antispyware are damaged from the predator software, or there is no problem at all. Once they have your credit card info you download more predator software under the camouflaged appearance of protection for your computer. What do you think they will now do with your credit card info? What if you catch them before you give them your credit card info? Even if you catch on that it is a predator it is extremely difficult to remove their fangs and claws out of your computer. Even experienced technicians will have to take 3 to 4 hour to remove it. For those who have paid and downloaded more predators, camouflaged as protection for your computer, it may take 3 to 4 days to remove! One computer recently came in for repair with 630 predators in their computer! Here are the images of the 11 most painful predators in the computer world and 11 creatures whose bite or sting are the most painful in the world! Unbearable pain just to breath ! Getting antivirus and antispyware is being safe! Not sure what you are buying? If you are not already receiving it, ask to get our news letter ! …They know when your awake. They know if you’ve been bad or good, so ..
Privacy has many definitions, definitions which are dependant on who you are talking to. Donald Kerr, Principal Deputy Director of National Intelligence perceives the definition of privacy as anonymity. Therefore from his point of view he believes in this day and time that it is impossible if there is to be security. In other words, privacy is what you and the government know about you and no others; this is for your safety! White Hats, Hackers, Phreeks (a portmanteau for phone and geek no I don’t know why there is an “r” in phreek) define privacy another way; that if you have given that information to anyone then they have a right to it as well. What is left is private. Then there are those that believe privacy is like going to the beach; if you go to the beach your going to be exposed or why did you go to the beach? What is the beach? The internet. This group of marketers who manufacture the majority of spyware feel they are allot like Santa Claus; “who sees you when your sleeping and knows when your awake and knows when you’ve been bad or good..” and for a price will give any information on any and every type of person who uses the internet ( Ho Ho Ho). One of the oldest is http://www.doubleclick.com/: for a list of most of the American companies that write the spyware programs go to http://www.spywareguide.com/creator_list_full.php?s=m. The final group of spyware writers is the smallest but the most infamous they are the Black Hats. These have the skills of all those above but are bad guys “black hats“. They are after your computer to make it commit crimes for them; so that the FBI knocks on your door and arrests you and not them. They work to get your name, social security, birth date and credit card numbers. No, they are not thieves who use your credit cards to go to Europe and eat at fancy restaurants and stay at big hotels then throw your card away. These guys are very intelligent and astute. They collect information and credit card info on hundreds of thousands of people. Then they make a $0.14 to $0.24 transaction of each card at the end of each month. How much is $0.14 X 100,000 ? Have you ever complained about a $0.14 charge on your credit card? No one does. Where does the money go? The money trail ends in countries at the fringes of international law; to countries in Eastern Europe and private organizations in Pakistan. What do they do with the money? I don’t think its anything legal! Imagine the thrill of listening to every cell phone conversation within 40 miles ! There are tens of thousands of these in the US. Are they illegal to own? No! Are they are illegal to use? YES! but they can not be detected if they are used. Honestly it’s far safer to use the computer on the internet then a cell phone to transmit personal information. With the Internet browser set to 128 bit encryption (and there is no spyware on your system) your computer is linked to the transactional computer and is virtually secure against anyone’s eyes while the information is in transit. How do you know its working? There will be a little padlock either at the top next to the URL (internet address) or bottom right corner of your Internet browser. Privacy to me is very simple. If I get private with my wife behind closed doors where I can plainly see the dimples on her cheeks then I guarantee she can see mine . Privacy is not one way. Bare truth from both parties is only right. If they want my privacy then I have a right to theirs or no deal! The same for the beach! You want to check me out in a speedo on the beach then you have to be wearing just as little or no deal ! I don’t care how big your belly is !!! Why is My Computer Problem called a Virus? Why isn’t it called a Bacteria? Virus are not the same as bacteria. Just as computer viruses are not the same as malware (spyware). If you can imagine an elephant being bit by a mosquito then you have the comparison in size between the bacteria (elephant) and the virus (mosquito). The question is what is a virus and why is the problem with the computer called a virus? Well have you ever wondered what is the determining factors for something to be called alive? What makes a rock not alive and a plant and an animal alive? First it consumes and second it grows and developes and third it reproduces itself. A bacteria does all these things and does it every twenty minutes! What about a virus? It does NONE of these things! Bacteria are micro scale and viruses are nano scale. A bacteria is very complex single cell organism. Picture in your mind a peach. If you cut it in half and looked at it, what do you see. (We are going to use the peach as an example of a single cell.) The skin would be the cell membrane, the meat of the peach the cell’s cytoplasm but the seed would be the cells nucleus. The nucleus is not really like a seed but more like a small ball of spaghetti. (you can tell I haven’t had diner yet!) The awesome thing about the strands of spaghetti is the length of the strand and the protein sequence, that length is the sequence of what the cell is to do its whole life! Including its response to any stimuli (things that happen to it). Its just like the programing code for a computer operating system! Didn’t know that the spaghetti like nucleus of a cell (DNA) was modeled after a computer’s operating system, did you? (smile) Just joking. What about the virus? Well it’s just a little snippet of the the spaghetti like strand of code in the nucleus of the cell in a fancy delevery box! This is a electron microscope image of a virus (bacteriophage) that is harmless to us but deadly to bacteria. The little appendages lock on to the elephantine bacteria while the shaft penetrates the cell membrane injecting the small package of a piece of spaghetti (protein code, DNA) from it little head into the cell. Once into the cell necleus it attach’s to the spaghetti code and reprograms the cell to literally dismantle itself and make copies of the virus! When the whole cell is transformed internally to nothing but virus clones the cell burst open and releases thousands of the little critters! Guess what they go and do? Well now back to computers. So what would you call a little snippet of computer code that takes the computers resources away to replicate itself as many times as it can destroying the computer’s operating system and using that system to infect other systems? Right, a virus! What would you call a small yet complete program that grows inside your computer’s system taking data and information, processes it and develops and finally replicates itself? Bacteria? No its called malware or spyware. Wait if small snippets of code that screws up your computer is called a virus then complete programs that process your personal information to send it to another location and replicates itself should be called Bacteria, right? Yeah, but if you said your computer had a bacteria instead of malware or spyware people would think that you were weird though you would be logically correct.